Ramblings of a Wildflower: Neighbourhood in Chaos! We have a new friend in my Chatham neighbourhood! When I got back home a week or so ago I noticed that quite often, birds in the area would be in a panic, flocks of them out fly very fast past the window...strange isn't it!? I figured something must be there scaring them off, whether a person or predator. One day while sitting at the table I saw a flash of a larger bird going by following a flock of mourning doves. I think I scared my parents by how fast I jumped from the table! "IT"S BACK! 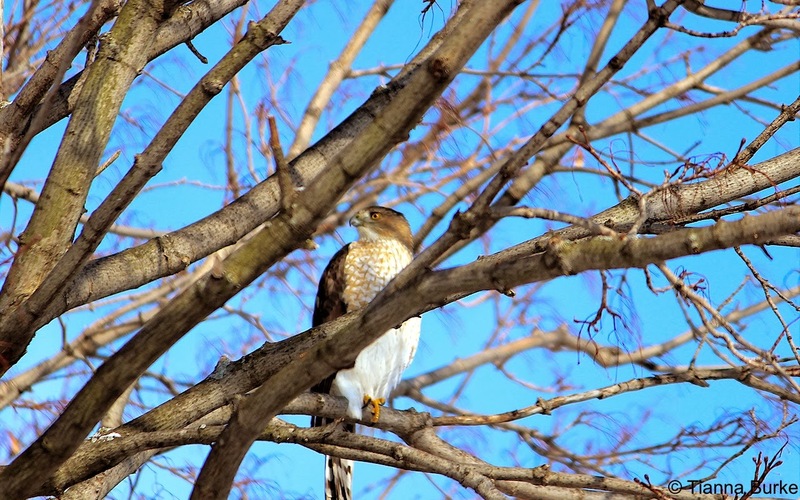 THE COOPERS HAWK IS BACK!" I screamed! 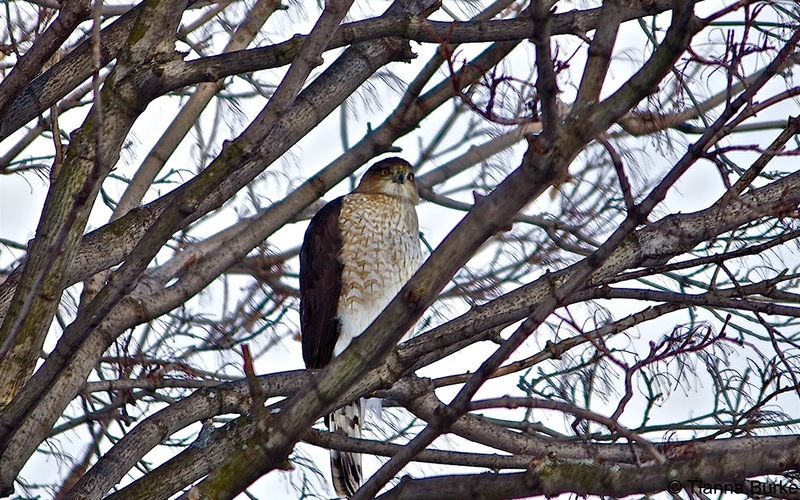 I remember last winter when I was home, I saw a Coopers hawk hanging around the neighbourhood, and that time it was in my tree! Now, although I am not overly sure if it is actually the same one...I have a feeling it is! You could say my Camera and Binos have been on high alert and stationed 24/7 on the kitchen table. 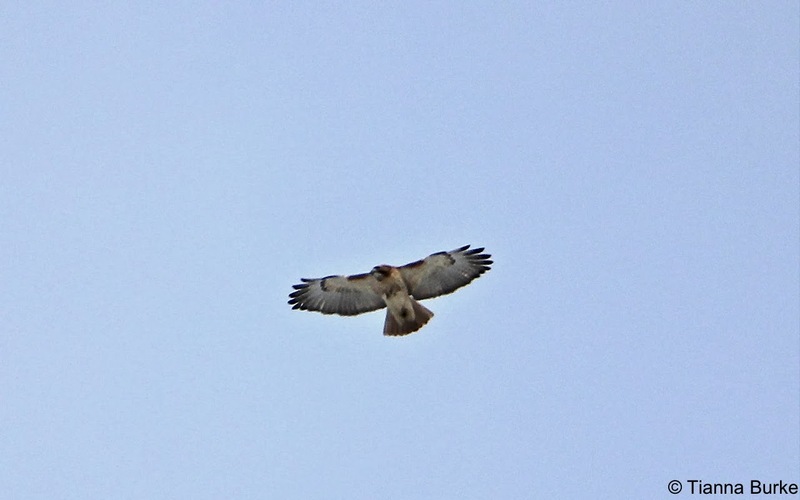 While outside one day I looked up and noticed a red-tailed hawk circling! I was actually really surprised as I've never seen one around my home before. It circled close over my house and then suddenly a second one joined in! 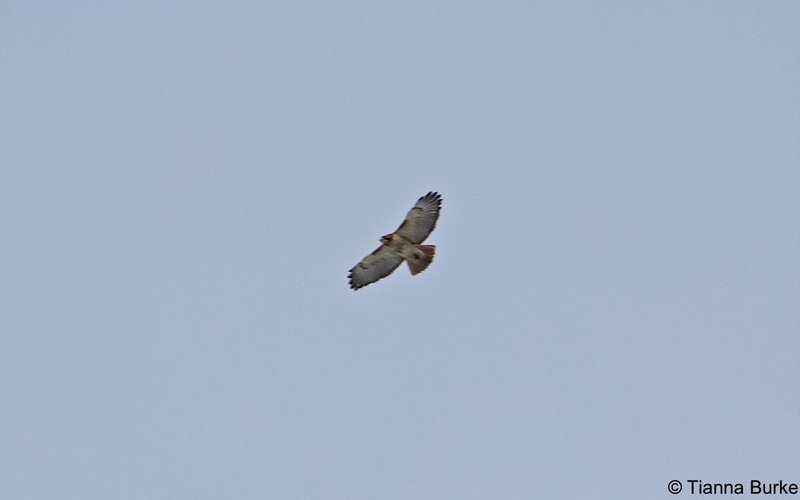 I'm not very good at ID'ing hawks at a distance...and unfortunately my hawk book is already packed away. Based on it's tail (spread out and no barring) and wings, I know that it was different than the Coopers. The tail had a reddish glean to it leaning me to choose Red-tail. 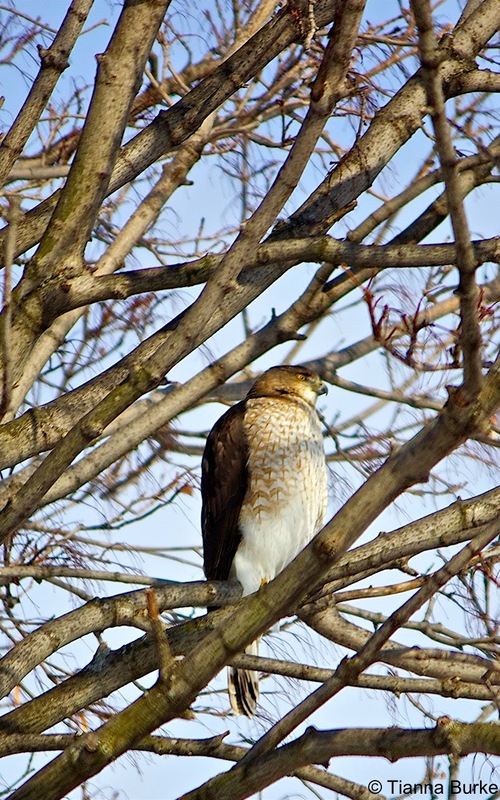 Two days ago, my dad and I came home from doing some chores and I spotted the Coopers Hawk in our neighbour's tree. What a beautiful sight it was! It stayed for a few minutes and let me take a few shots of it, but unfortunately flew off once I came a little too close to it. Someone posted in a local site asking what to do in Chatham for the day, they were tired of only going to a skating rink. I replied to the post saying that it is an amazing day and we have many local places to walk and hike like Rondeau, Paxton's Bush, or St. Clair NWA. The lady said "Oh that's always the same old". This comment really struck me as being funny and strange. When I look in my backyard, that I have seen for the past 11 or so years, I barely ever see the same old thing. Sure the same tree is there, the garden is in the same spot, but there is always something new to see. I've been to Paxton's Bush ever since I was 6 and there is still always something new to experience, I guess you just have to be open to looking and seeing the differences. Quick Trip to the Sault.